To briefly summarize, I find their work and methodologies very interesting, especially given that they appear quite different than other such measures that purport to depict/predict economic activity. Given its proprietary methodologies and relatively limited history, it seems likely that varying interpretations of The Consumer Metrics Institute’s data can be supported. 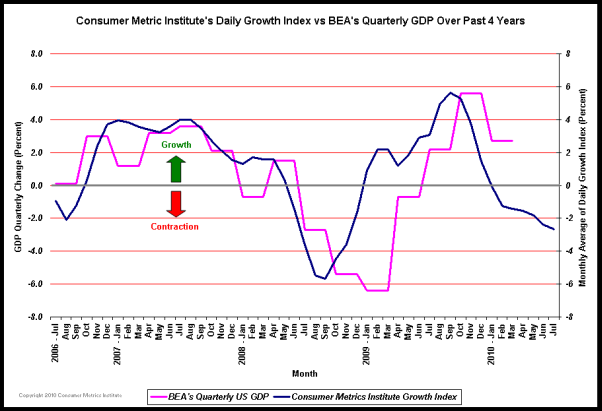 My interpretation of the chart is that the growing “rift” between GDP and the CMI’s Consumer Growth Index is significant. This begs the question as to which trend will prove accurate going forward; that of GDP growth around 3% (that which is the current consensus among economists for both full-year 2010 & 2011) or that of the CMI’s Growth Index, which seems to be indicating some type of impending negative (perhaps significantly so) GDP growth rate? Of course, one can argue that the CMI’s growth rate can suddenly materially increase, which would likely support a positive GDP growth rate. Of course, such a sudden increase is possible, but my “guess” (which is seemingly all that one can offer, given the proprietary nature of the data) is that such is unlikely. 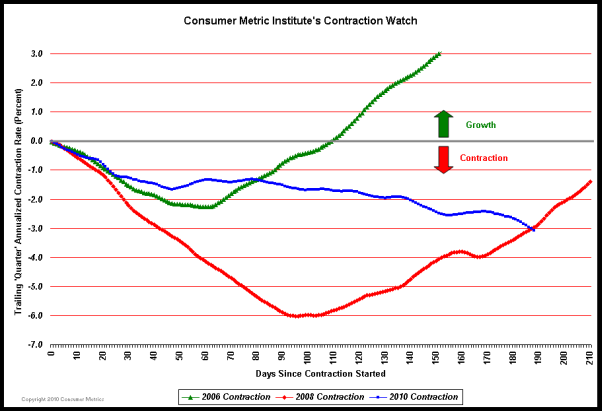 Of further note is the CMI’s “Contraction Watch” chart (not shown) and its implications. Of course, the CMI’s readings of weakening economic activity are not entirely unique. ECRI’s recent WLI Growth readings have generated much discussions lately given the WLI Growth’s significant and rapid decline. This entry was posted in Economic Forecasts and tagged Consumer Metrics Institute, economic forecasting, economic indicators on July 27, 2010 by Ted Kavadas. I find this chart interesting especially given its long-term perspective. This entry was posted in Uncategorized and tagged current economic situation, Household Income on July 26, 2010 by Ted Kavadas. 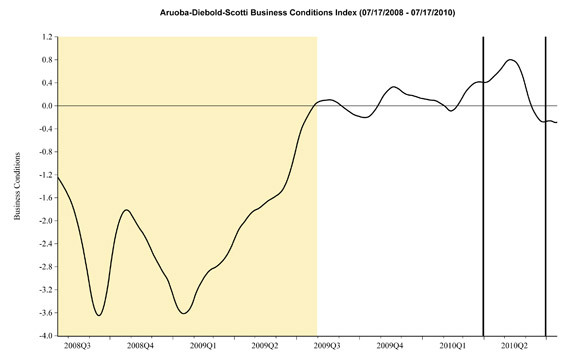 This entry was posted in Uncategorized and tagged Consumer Confidence, small business on July 23, 2010 by Ted Kavadas. The story highlights the practice of converting paved roads to gravel instead of repaving them in order to save money. This is yet another example of our (national) inability to maintain our infrastructure. I believe that the current state of our national infrastructure represents a “silent crisis.” It is not one which receives a lot of press or attention, yet is very significant for a variety of reasons. Apart from the obvious risks posed to citizens from decrepit, crumbling infrastructure there are other broader issues. The longer one waits to fix the existing infrastructure, the higher the cost. Needless to say, at this time there is not trillions of dollars available to make the needed repairs. As such, one is led to wonder when such repairs will be made. Even if the trillions of dollars needed were suddenly available, such repairs can’t be made in a short time period due to a variety of factors. Of course, it is easy to let such repairs “slide”, since the costs are high and few currently seem concerned about the issue. This entry was posted in "Economic Brownfield" and tagged "Economic Brownfield" on July 22, 2010 by Ted Kavadas. I have written of “odd occurrences” and their significance, most recently in the July 14 post. Plotted below the 2-Year Treasury yield is the price of the S&P500. As one can see, the 2-year Treasury yield at .61% is now at a level less than that seen during the height of the Financial Crisis during Q4 2008. While there are many reasons that can at least partially explain why the 2-Year Treasury yield is so low now, it is still what I call an “odd occurrence.” Why, during what most believe is an economic recovery, with generally robust financial markets, would investors in the 2-Year Treasury accept such low yields? 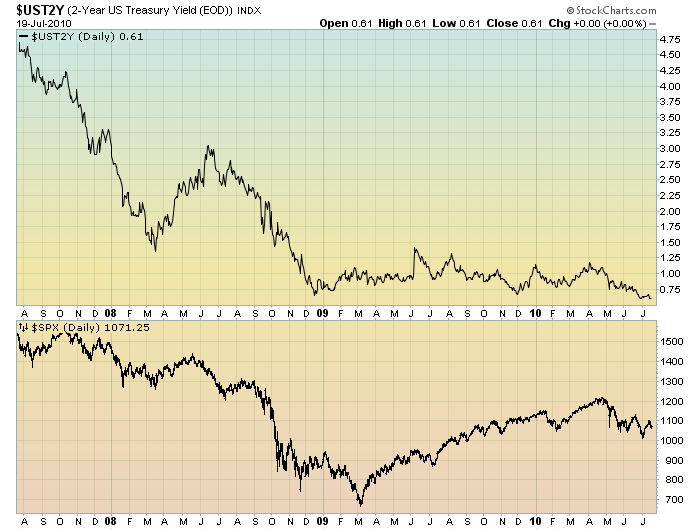 Of note, this 2-Year yield has acted strangely in the past; I commented upon the dip in yield during November 2009 in this November 23, 2009 post. This entry was posted in Investor and tagged short-term Treasury yields on July 20, 2010 by Ted Kavadas. With regard to the finance reform bill, I found a few comments in Friday’s (July 16) Wall Street Journal to be notable. I am in general agreement with the quotes from Peter Wallison and Richard Shelby. I included the quote from Janet Yellen as I believe it is notable, and frankly, I was surprised to see it. From an “all things considered” standpoint, I don’t believe this bill provides any aggregate value. It won’t prevent any future financial crisis. I think it is notable that there is so much negative commentary about this bill from the financial and economic community; some of this commentary is appended to the second story mentioned above. Furthermore, not only does this bill not provide aggregate value, but it also has the potential to be quite pernicious on numerous fronts. At this point, it is impossible to predict how this bill will be enacted; however, it is clear that there is outsized potential for many unintended harmful consequences. This entry was posted in Uncategorized on July 19, 2010 by Ted Kavadas. “For a variety of reasons, I am not as enamored with ECRI’s WLI and WLI Growth measures as many are. As one can see, the chart shows the history of the ECRI WLI Growth vs. GDP and recessions from 1965. First, as one can see, this swing dwarfs others from a long-term historical perspective. 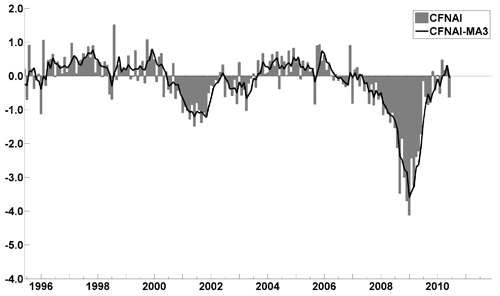 Second, as many have commented, this depth of negative readings has a high incidence of presaging recessions. Fourth, another question to ask is how one should interpret such a pronounced spike and then decline? One thought is that the index may be exhibiting more volatility than in the past – which may distort any historical comparisons, correlations and/or conclusions one may make with regard to its movements. Fifth, I find the long-term chart (not shown) of the ECRI WLI (Weekly Leading Index) itself to be rather interesting. This entry was posted in Economic Forecasts and tagged commentary on ECRI, economic forecasting on July 18, 2010 by Ted Kavadas. I found a few items of interest in The July Wall Street Journal Economic Forecast Survey. As well, there a variety of interesting questions asked of the economists. These questions are seen in the Q&A section of the detail. As compared to last month’s survey, there was little change in the above categories. 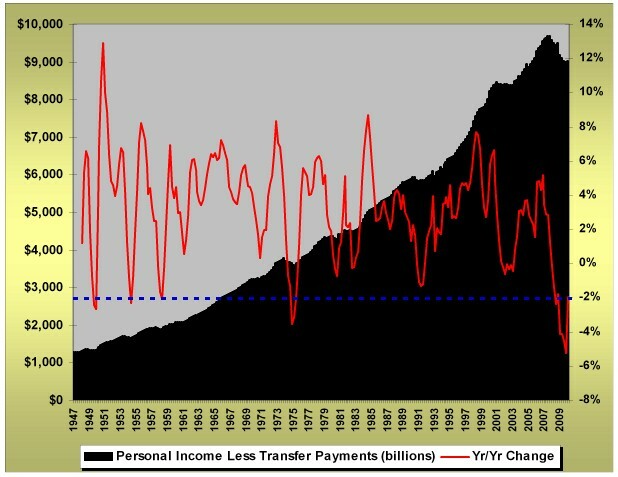 This entry was posted in Economic Forecasts and tagged Economic Forecasts on July 16, 2010 by Ted Kavadas.